Has over 40 experience in supply chain and logistics in the petrochemical, chemicals and fuels sectors, primarily in the UK. Over 30 years in 3PL and 4PL, responsible for national and international transport and distribution, managing multi-site operations and managing outsourced on-site logistics for global manufacturers, involving both bulk commodity and specialty chemicals, involving bulk storage, container storage, warehousing and repacking operations. For three years held global responsibility for safety with a major 4PL whilst acting as consultant Dangerous Goods Safety Advisor to major global petrochemical, chemical and fuels producers. Came to the GCC in 2009 to lead the development of a chemical logistics strategy for a major LSP. For over three years was Supply Chain and Logistics Consultant to MODON the Saudi Industrial Property Authority, leading the development of multimodal logistics terminals (MLT’s) to connect industrial cities by rail and other logistics projects to improve logistics quality and safety in Saudi Arabia. 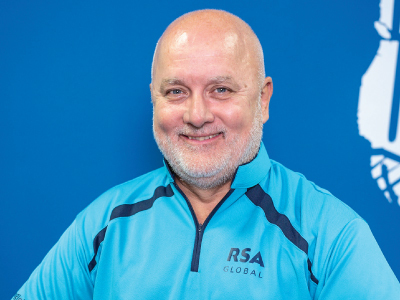 Joined RSA-TALKE as HSSEQ Manager and Business Advisor in 2017 where in addition to managing HSSEQ he is also supporting the development of new services and strategy. Has been an active member in industry associations and industry / government consultative committees aimed at improving standards in the UK. And in the GCC involved in the GPCA is a member of the Gulf SQAS Committee, is the SME for the Responsible Care Distribution Code and for two years led the Dangerous Goods Road Transport Regulations Task Force.